Mumbai, January29 (AFP): From silent black-and-white films to colurful blockbusters bursting with song and dance, the evolution of Indian cinema is traced by a new museum in the home of Bollywood. Costing 1.4 billion rupees ($19.6 million), India´s first national film museum is spread across a stylish 19th-century bungalow and a modern five-storey glass structure in south Mumbai. “It showcases to the world outside what Indian cinema has achieved in its entirety over more than 100 years,” Amrit Gangar, a consulting curator on the project, told AFP. Movie-mad India today produces around 1,500 films a year, dwarfing even Hollywood´s output. The government-funded National Museum of Indian Cinema (NMIC) boasts stacks of memorabilia, recordings and film-making tools as well as interactive touch screens where visitors can watch clips from memorable movies. Movie buffs can learn about India´s first full-length feature film, the 1913 Dadasaheb Phalke-directed “Raja Harishchandra”, and listen to recordings of KL Saigal, considered the first superstar of Hindi-language cinema. They are also able to view hand-painted movie posters, including for internationally acclaimed director Satyajit Ray´s 1955 hit “Pather Panchali”, and click selfies beside a statue of Bollywood icon Raj Kapoor. 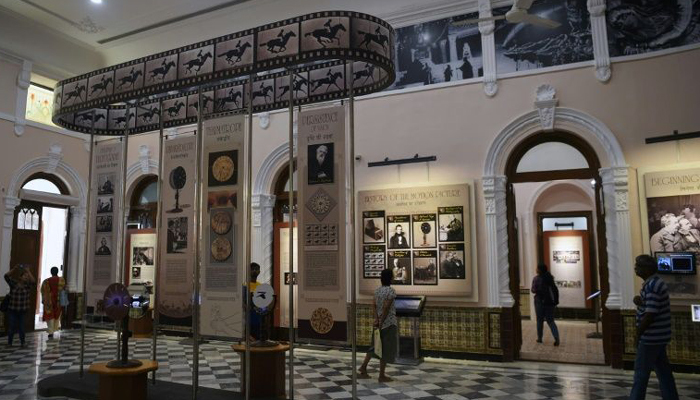 The museum takes visitors through “the journey of Indian cinema, from silent films to ´talkies´ to the studio era to the new wave,” Prashant Pathrabe, director general of the Indian government´s film department, told AFP. Bollywood is a nickname for the Hindi-language film industry that is based in Mumbai, formerly known as Bombay. The museum celebrates not just Bollywood but also the movies made in the various regions and languages across India. “Films are made in about 25 different regional languages in India and all are included here so that the entire country, irrespective of which part you come from, can enjoy this museum,” said Pathrabe. The museum also hosts replicas of the Mutoscope, the camera used by the Lumiere Brothers, and the Praxinoscope — a spinning cylindrical animation device invented in France in the 1870s. The idea for the museum was first mooted in 2006 and it was due to open in 2014 when the exhibition rooms housed in the 6,000 square foot heritage building were declared ready. However the opening was delayed after the government decided to build the new wing, which includes a section exploring the impact independence hero Mahatma Gandhi had on cinema around the world, including on Charlie Chaplin. “This is the first time I have seen such a huge museum about cinema,” said Maria Jones, who had travelled from her home in the southern India state of Kerala, to visit the museum. “I´m really happy and excited to see the history of Indian cinema until now. The different cameras have been fascinating for me. The first cameras were really huge,” she told AFP. The museum does contain some gaps though as many of India´s early films were never preserved while other artefacts have been damaged over the years. For example, the last remaining print of India´s first “talkie”, the 1931 “Alam Ara” (The Light of the World), was destroyed in a fire in 2003. Still, officials expect the museum to be a hit with fans. “It´s an education in cinema,” said Pathrabe.